You can find and restore lost images from your digital camera or any other type of file. Restore deleted files from hard disks, USB flash drives, CD/DVD disks, CF, SD or Memory Stick cards and other storage media even if they emptied from the Recycle Bin. You can find and restore lost images from your digital camera or music files from your iPod or other mp3 player. All types of files are supported: photos, images, all types of document files, music, email databases. No installation required, so you can run the program from USB flash disk and find deleted files on any PC. You have the possibility of previewing found deleted files before restoring them. .Thumbnil preview mode for deleted files.You can preview your file content in using internal program viewer (for example, you can see all your deleted photos from your digital camera before you recover them) which tells you if a successful recovery is possible. You'll know in advance exactly which files can be recovered. .The program can scan disk for deleted files with any Windows file system. .Recover files even if they emptied from the Recycle Bin. 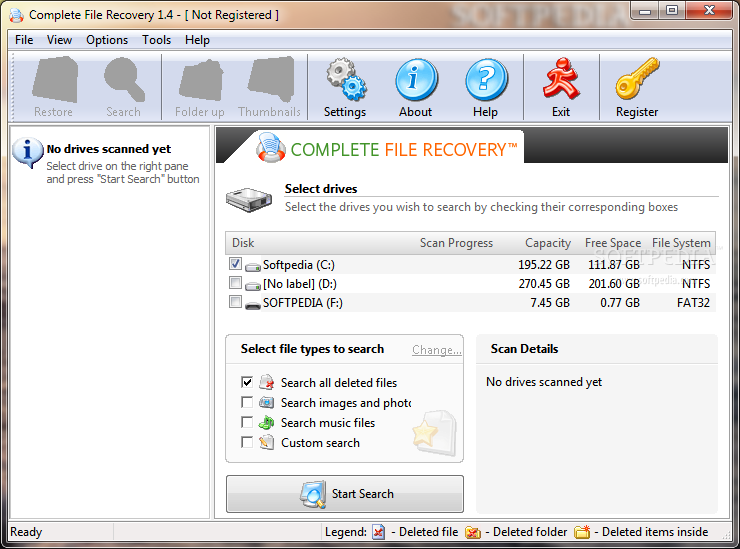 Complete File Recovery can find and recover any type of deleted file - program, music, photo or video. However, it has a set of specially predefined file types with advanced search algorythms.